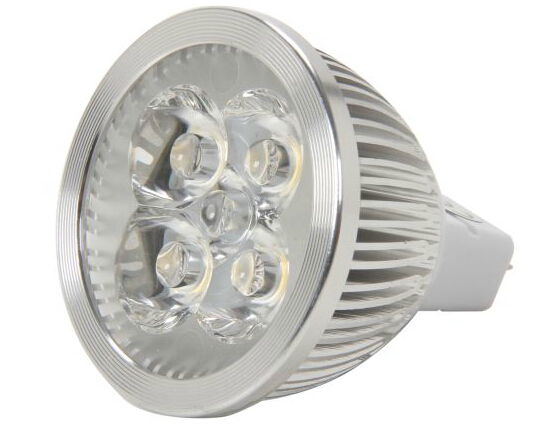 A great placement of 25-watt halogen, the Collection LED CL-MR16-4W-W goes with the trend of green lighting with 4-watt power consumption and amazing 40,000-hour life time, which is 10-20 times longer than Halogen. Its Epistar diodes produce no UV light that attracts insects, or may damage fabric & materials. This LED bulb produces 25-watt halogen equivalent lighting performance with 4-watt power consumption, which translates to $22.08 saving on year running cost compared to halogen. (Based on a 24×7 running with the rate of $0.12) The 40,000hr life span further reduces the maintenance and replacement cost compared to 2,000hr ~ 4,000hr of the halogen. Fitted with Epistar diodes – the high brightness tier 1 lighting technology, the Collection LED CL-MR16-4W-W delivers 250 lumens of warm white light with 45-degree beam angle. The constant light stream with no high frequency flickering is easy for the eyes. Polycarbonate lens is shatter resistant & cool to touch. 100% aluminum heat-sink prevents excessive heat buildup in the bulb & its surrounding.